What's The Best Hot Tub? While hard at work, you find yourself thinking of relaxing at the end of this very long and stressful day. Visions of sitting in a steamy hot tub, with a cold drink and a couple of friends are very inviting. Should you take steps to making that vision a reality? 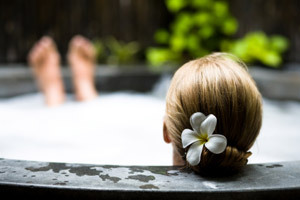 There are definitely many benefits to owning a hot tub or spa. Your tired and stiff joints will get a much needed heat treatment with a hot tub. The hydrotherapy will not only soothe those tense muscles but can increase flexibility as well as your range of motion, not to mention the sheer pleasure of relaxation. When you are sitting in your hot tub, you aren't working at your computer, mowing the lawn or vacuuming the living room. You are forced to just sit there and ahhhhhhh, relax. But before you pull out your credit card and buy, you have to make some important decisions. Take a little bit of time and read through our helpful buying guide, check out our hot tub reviews and our hot tub forum before you take the plunge! First things first. Do you live in a municipality or are you part of a homeowners association that requires that you get approval prior to adding anything outside your home? Get that done before shopping. You don't want to discover you need this written permission or that you have a neighbor who wants to be a pain in the rear end while your new tub is being delivered. We will also discuss many other key areas you may not have thought of while envisioning the relaxation that awaits. Where is your hot tub going to be placed? What type of power will you be providing the tub? Do you have that perfect spot to set the hot tub -- is it really perfect? We can almost hear the gears clicking in your head from here- good. Read up and be an educated buyer. Re: Wet testing pointers - when you cannot test exact model?